Palmerston Campus administrator Nyree Terry has received the Palmerston Proud Award in recognition of her contribution to the city’s educational facilities and community relationships. It was presented by the Her Worship the Mayor Annette Burke JP, at the council chambers last night (22 November). Nyree paid tribute to the staff of the Palmerston Campus and said their contribution and hard work were behind the recognition. ‘This honour reflects the campus as a team and interaction staff undertake with community, government and local industry,’ she said. Nyree said fostering relationships across the wider community was an important role of the Palmerston Campus. ‘The combined effort of staff to engage the wider community has improved CDU’s presence in Palmerston and I am proud to work with a committed team,’ she said. Nyree was nominated by an anonymous member of CDU Palmerston. 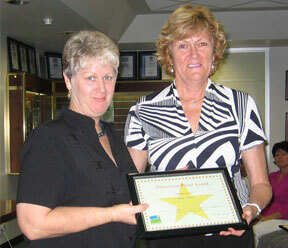 The awards are held three times a year and honour individuals and organisations contributing to the City of Palmerston.